Yaakov's daughter Dina was a tzadekes and it has been taught that she would have had the power to positively influence Esav had she married him. While she never married Esav, the Sifsei Chachomim taught that she caused Iyov to become a Ger, married him, and influenced him to go on become a great tzaddik. Every married man has his "Dina". In what ways has your wife influenced you to become a better person? Before I get to your question… Dina is an interesting character in general. She's the first Jewish daughter mentioned in Torah (Sarah, Rivka, Rochel, and Leah are all relatives, but not children of avos / imaos), and she is Yaakov's only recorded female birth. It would seem that Dina is the quintessential Bas Yisroel (literally and figuratively) – and in fact, it is here, after the story of Dina, that we first find the name Yisroel used in reference to the Jewish people (Bereishis 34:7). It's also interesting to note that some ascribe a different shevet for each of the 12 months of the year, and during a leap-year the extra month, Adar II, is ascribed to Dina. 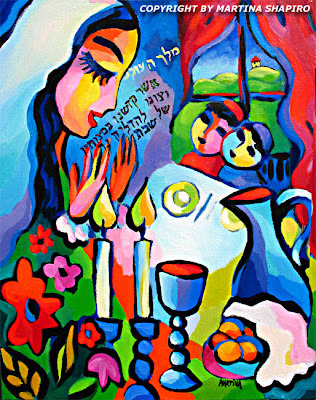 And, of course, Adar II contains Purim which is the single most female-centric Yom Tov we celebrate (Esther and lehavdil Vashti and Zeresh all play prominent roles). So, it would seem that the power of the Jewish woman is in Dina. Dina is full of potential, full of possibilities. Dina can change the world. She could have influenced Eisav, she could have influenced Shechem, she could have uplifted the lowest to the highest, but it was not yet to be. Targum Yonason explains that Zimri ben Salu is Shaul ben haCannanis -- Dina's son -- who also mistakenly sought to achieve what Dina could have potentially achieved, through his relationship with Cozbi bas Tzur. Of course, once again, the time wasn't right and Zimri was killed. The Ohr HaChaim point's out however that he is called Ish Yisroel – that he maintained his portion in the World to Come…but I digress. Dina has a deep longing to improve the world around her. She believes in her potential and in the potential of others. I certainly think every woman must share that belief whenever she decides to get married. She must believe that she can make her husband a better man, her children better adults and the world a better place. I am certain that, if not for my wife, I would be quite far from where I am today. She is my conscience. She is my stability. She believes in me and in my potential more than I do, and as such I have been a better person than I would otherwise have been. She knows when I'm in the wrong, or lazy, or flat out asking for trouble. I can't count the number of times that before doing something I have had the thought, "can I defend this to my wife?" At various times when I've wanted to move my wife has always asked: "Where will we be better Jews?" When I've wanted to change a minhag or practice, my wife will invariably ask, "Does a change like this make you closer or farther from who you think you should be?" She reminds me of priorities, she reminds me of what's virtuous. Examples can sound silly; often they are small things but they're significant nonetheless. She'll send me off to minyan when I'm about to daven in the house. She'll encourage me to spend time with, or be nicer to, the kids. She'll be the one to intuitively know if I'm going to do something stupid or inappropriate. Where I'm open to making concessions, she'll know which concessions are a bad idea. She remains idealistic while I probably haven't been too idealistic in many years. So, if you ask me "in what ways has my wife influenced me to become a better person," I don't even know where to start…she influences me to be a better person in every way and all the time; everything that I am I owe to her. I couldn't help but cry when I read this one. But I'm an extremely sentimental old man! why you cry when you can kvell instead? I'm not such a rationalist to be able to choose my emotions! But thanks... I kvell, too. "Yaakov's daughter Dina was a tzadekes and it has been taught that she would have had the power to positively influence Esav had she married him. While she never married Esav, the Sifsei Chachomim taught that she caused Iyov to become a Ger, married him, and influenced him to go on become a great tzaddik. Every married man has his "Dina"." 2) Iyov was a great man, but he still did not reach the level of others and is generally not thought of among other tzadikim of the Biblical era like Moshe Rabbeinu, Aharon Hakohein, Shlomo hamelech, Dovid hamelech, etc.. I guess he is thought of sort of like Noach - a tzaddik, but with limitations. 3) Not every married man has his Dina. Don't forget the posuk (brought in gemara) of motzei ani es haisha mar mimoves. Not all women are righteous on the level of Dina. Women are able to sin too, can descend to depths...They also have a yetzer hora. Finally, I would also like to make a general comment. You posted a related piece from the Biala Rebbe earlier, yet, as usual when you post such pieces, you left no provision for comments there. That means that you leave no provision for discussion with such postings. Why is that so? 1. & 2. Everything in Torah has multiple explanations, and I'm not even sure what your taking issue with , but isn't what your saying really beside the point? 3. Obviously, we're speaking about a good wife (did this really need to be explained?). We weren't addressing contentious, troubled, unhappy and unfortunate marriages. That's a different post for a different day. B"H, I am thankful for the marriage I have, and I was speaking anecdotally (because ASJ asked me anecdotally). Chassidim say: Two people is Yetzer Tov's & one Yetzer Hora. Chassidim say: Two people is two Yetzer Tov's & one Yetzer Hora.